It’s that time between the holidays of the sun and the holidays of the moon, between the piles of toffee and the platters of spring rolls, when I try to take a breather. As the décor shifts slowly from red and green to red and gold, my table overflows with refreshing escarole, shaved fennel, crinkly frisée, crisp breakfast radishes and nuggets of ruddy, roasted beets. Bowls of tangerines stand ready in nearly every room, while a very large, extended family of apples takes up residence in my kitchen. But, truth be told, surrounded by all that wintery goodness, I still crave buttery richness. The cookies are all consumed. The last of the rum balls disappeared days ago. Even the emergency chocolate tin is empty. No need to shock my system by going cold turkey. With one final, brave stick of butter and lots of booze still in the house, I turn to an old favorite for winding down slowly. For those trying to watch their cholesterol intake, you can stop reading right now. Ditto for the vegetarians and the hard-core dieters. Teetolers might also want to move along. For those remaining — those of us who still manage to reward ourselves during these darkest days of January — it’s time to whip up some chicken liver paté. As buttery treats go, liver is dense with protein, vitamins and minerals. A few crackers spread thinly with this paté will make the bitterest salad sweeter. Accompanied with a thinly sliced apple and a glass of wine, it becomes a very adult way to enjoy a movie at home. And little ramekins set out for guests never fails to impress. My first secret? As it very often happens to be: lots of booze. After all the holiday baking and entertaining, there’s usually an inch or two of bourbon or cognac handy. If not, I use the dry sherry in the pantry. Even plain-jane vodka would work. I’ve decreased the amount of butter in traditional recipes (2 sticks of butter!) by upping the amount of cognac. The extra liquid helps maintain a light emulsion, lending a sense of richness with significantly less butter. You can skip the liquor, but then you’d need to use more butter. Your choice. My second secret? Lots of herbs. Fresh thyme and marjoram specifically, but the dried stuff is fine. This is also a great way to use up that very cute but seemingly endless little crock of herbes de Provence. My third secret? Puree the begeezes out of it. 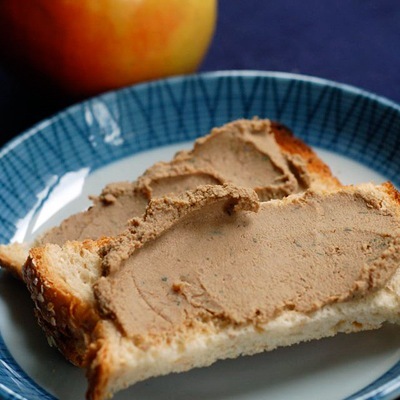 Chicken liver paté is one of those super simple recipes that adapts to whatever you have in your kitchen and doesn’t require measuring cups. I recommend dividing up the batch into little ramekins or lidded containers (vintage Pyrex refrigerator bowls are perfect for this) to stretch out the supply. A quarter inch layer of clarified butter poured over the top, and then a piece of parchment paper cut to size will extend the life of the paté by weeks. After it hardens in the refrigerator, the butter cap can be lifted out to reveal a patiently dormant treat. Finally, please take the trouble to hunt down organic chicken livers. As one of the cleaning organs of the body, livers absorb toxins. So even if you don’t regularly buy organic meat, it’s certainly in keeping with eating healthfully to use the livers of chickens who have enjoyed a cleaner diet themselves. Call ahead, as not all butchers stock livers let alone organic ones, and be prepared to thaw out frozen ones. Before cooking them, be sure to trim them of all those white membranes that connect each pair. That’s the final secret to a smooth, light texture. 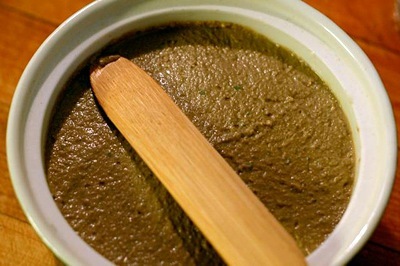 It’s best to let the paté rest in the fridge one or two days after making, to let all the flavors meld and mellow. Serve at your next dinner party with cornichons, radishes, crusty bread and a good, robust mustard. Or just spread a small amount on some still-warm toast for a late-night snack to soften the landing into 2009. Combine the livers, 1/4 cup liquor, herbs, salt and pepper. Stir well, and then let stand for 30 minutes. Melt butter in a wide skillet over medium low heat. Add the onion and cook until soft and translucent, 5 to 7 minutes. Stir in the garlic and continuing cooking for 2 more minutes, taking care not to brown the onion or garlic. Add the livers and cook, turning them occasionally, until the largest lobes are just slightly pink at their center, about 10 minutes. Transfer to the bowl of food processor and let cool slightly. Add the remaining 2 tablespoons cognac, then puree until very smooth and light, scraping down the sides of the bowl as needed. It will seem overly thin, but keep in mind that it will thicken and set once chilled. If needed, season to taste with additional salt and pepper. Adding more liquor is perfectly fine, too. Transfer the paté to ramekins, smooth the tops flat, press plastic or parchment against the surface, and refrigerate. And if you don’t fancy making it – you should check out our website!! Any paté made with generous lashings of alcohol has to be a winner in my eyes! 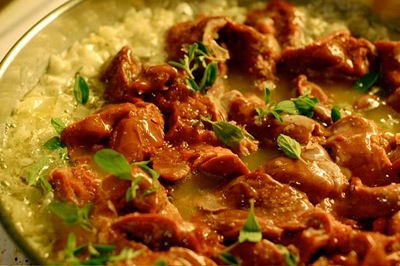 Wild boar livers with bourbon and blueberry’s…. oh yay.